finally got the chance to up load some of the dresses I have done to go in Christmas shoe boxes to orphanage and school in Haiti. If you remember 100 boxes 50 girls and 50 boys. also 5 of us girls in Homemakers hand quilted a King quilt for the volunteer fire Dept to raffle off for a fund raiser. we had help with all the blocks from others who could sew but just the 5 of us could quilt. Did not get a pic before the presentation of the quilt. It was Red white and blues(calicoes) sashing and backed and bound in white. Beautiful! 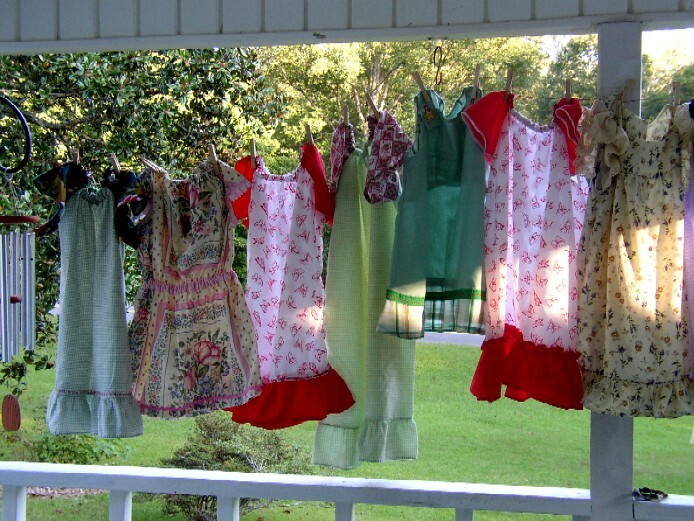 All dresses, the fabric is mostly donated to me. love you guys! So beautiful! Some friends and I are going to make some little dresses. I like these better as it seems they would last longer than pillowcase dresses. Is this a pattern you could share, or tell me where to get it? Type in Lillian's Dresses for charity on computer(I am not that Lillian) search and you should get several choices of her patterns. It's a basic pillow case dress with sleeves added and elastic for neck. Not in any shape this moment to go into a lot of details. Pain is bad! So beautiful! Some friends and I are going to make some little dresses. I like these better as it seems they would last longer than pillowcase dresses. Is this a pattern you could share? Wonderful job. Don't know how you have time to work on these. There will be some very happy girls...Well done Miss Lillian! Such a nice assortment for those lil girls. They will brighten their lives. Very nice! Well done, Lillian! These will bring smiles into young lives. Thank you Toogie for your sweet words. They look wonderful, some lucky kids, great job. Thank you my dear. They do not have the finesse you have in your beautiful work, but these kids that have a home do not have water so clothes are washed in a creek. Those in orphanage have a well with water piped in. Your hands work beautiful magic. WOW! you have been so busy, no wonder I haven't seen much of you on here. You are such a sweetie to do all this for those children. Would have loved to seen your quilt too. Thank you Chris. Love you too. I'm currently without a camera. Dropped mine and broke it but maybe Kathy(my friend and room mate will make some. Thanks Shirley. These kids live in very hot ,hot country so every thing they get to wear is light and airy. I understand most have never even had a pair of shoes. We try to send what I call Flip Flops to put on their little feet. Lilian, your dresses look wonderful and there will be a bunch of happy girls! great work! Thank you Martine. They are all labors of love. What a fabulous achievement. 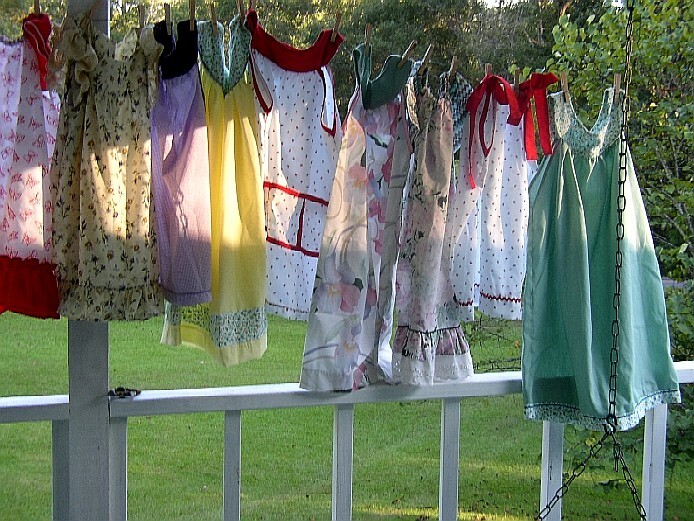 I am sure there will be many happy young ladies who will be delighted to receive these lovely dresses. You are very generous. Are you able to show us the King Quilt? Wow Miss Lilian, those Dresses look beautyful, i'm sure the girls will be very proud to wear those dresses. What a wonderful act of kindness! These a lovely - the girls are surely going to feel so pretty wearing them! They have so little . I've seen videos of them opening their boxes. Their smiles are so wonderful.. The dresses look wonderful! You all's work will surely be appreciated. Oh Miss Lillian such nice work and worthwhile cause. I hope it also means that you are feeling better. I am doing good Angie. Try to stay real busy. Going to Homemakers Convention next week. Leave on Tues. back home Thur. 4 hr drive but riding with someone else. Have never been able to go. Leery of being that far from home and family but going with a good friend much younger than myself and she will be in same rm with me. Going to be at a State Park and will be doing crafts and such. Awesome. Have lots and lots of fun.